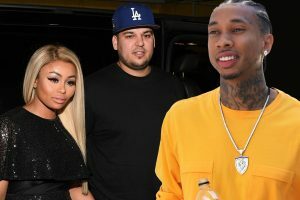 Blac Chyna wants to set the record straight regarding reports surrounding her former relationships with baby daddies Rob Kardashian and Tyga. Chyna spoke out in a since-deleted Instagram Live video about the recent headlines against her, including her mother, Tokyo Toni, saying Chyna’s kids should live with their fathers. The former “Rob & Chyna” star spoke of her court battles with Rob and said she wrapped up those cases as quickly as possible. Chyna, who despite splitting from artist Kid Buu after a police-involved brawl in Hawaii, said she’s living her “f–king life” and it’s no thanks to Rob or Tyga. “Rob didn’t help me, Tyga ain’t help me, Toni ain’t help me, but like try to like, smack me down, period, and I’m just letting y’all know this, all this s–t, I built by myself,” she said. Although she claimed she’s never asked for child support, Rob and Chyna have been locked in a legal battle over it for months, with Rob requesting to pay less money to Chyna because his finances have taken a hit since he stepped away from social media. In fact, his attorneys determined that Chyna should pay Rob instead. A rep for Tyga didn’t immediately respond to Page Six’s request for comment.